I have read and heard many tips about how to deal with target panic. However, any solution short of creating a true surprise release is only a temporary fix. You can trick your brain into forgetting about the "Now!" command for a while, but then it will come back again and you will be right where you started. The "Now!" command itself is the problem; for some reason we eventually start to anticipate when the pin will be on the spot and we try hard to make the shot go at just the right time. Eventually, this degenerates into target panic. Some people experience target panic by locking up just below the spot, for example. Sometimes a twitch creeps in as we try to time the shot. Regardless of the symptoms, target panic stinks and you have to deal with it harshly to kill it. The solution is both simple and difficult. It's simple because it requires only one achievement — creating a surprise release. However, it's hard for many people to get used to doing this. It requires a complete reprogramming of the nervous system. There is only one brute force method to make it happen and that is what I recommend to everyone: use a pure back tension release for the next 8 months and by fall you will have forgotten what the words "target panic" even mean. You can't easily time a back tension release. You simply aim and pull as you naturally turn your release hand through the shot. You will hate it at first. It will scare you. 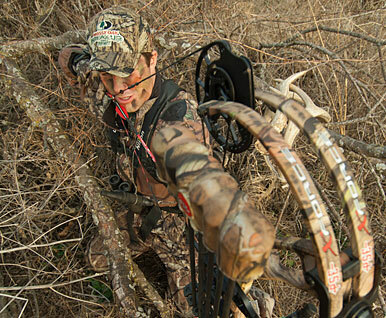 For the first time in your life you will learn what a bow sling is really for! The shot is supposed to startle you when it goes off — at least at first. After all, it is "surprise" release. Within a few days it will stop scaring you. Switch back to your hunting release a couple weeks before the hunting season, but keep squeezing the trigger to duplicate this surprise release. In my experience, this is the only solution that works every time.